Kelley Dewatering & Construction Company (KDCC) offers professional, problem solving service as a subcontractor to municipalities, construction,and consulting engineer firms throughout the contenental United States. Our involvement in site dewatering,maintenance and water supply is total, from preexcavation research and evaluation of plan and equipment requirements through the completion of the project. 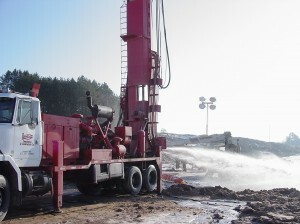 We are staffed and equipped to give your project an accurate and affordable construction dewatering program with constant attention and monitoring throughout the dewatering process. Skilled personnel and various technical and operational equipment are needed for sound planning, accurate cost estimation and effective dewatering procedure. Our facilities offer all of these. We continue to serve general contractors throughout the United States in site dewatering of major building projects such as nuclear and fossil fuel power generating stations, works undertaken by the U.S. Corps of Engineers including dams, flood controls and relief wells. We have played a vital part in many municipal projects waste treatment plants, sewer lines, sewer tunnels, test wells, water supply wells,hydro study, instrumentation and controls, and dewatering for the construction of large complex projects constructed by international corporations. The process of fulfilling each Kelley contract is a commitment to performance and full cooperation with our client. We at Kelley have accepted the client's goal as our own, as dewatering is a major step that enables the contractor to achieve his goal. Consider Kelley for your next dewatering or water supply project, and please add KDCC to your bid invitation list. KDCC is fully insured and can provide bonding. Information and references are available on request.